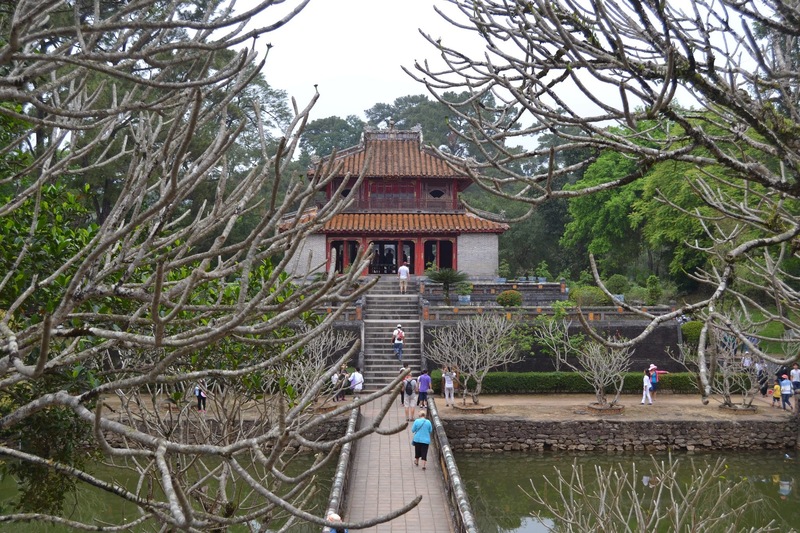 Hue ~ A Fragrant City with a Slow Pace – E.A.T. The citadel rests safely inside the moated walls of this old city. What must have been an impressively beautiful sight once, is, as most ancient things become, worn down by tourist’s feet, decades of wars and overgrown by misplaced trash. You can see the inherent beauty and try to imagine the courtyard swimming with the color of royal festivities. Entrance is about 5 US$. It is a great place for pictures and slow walking. 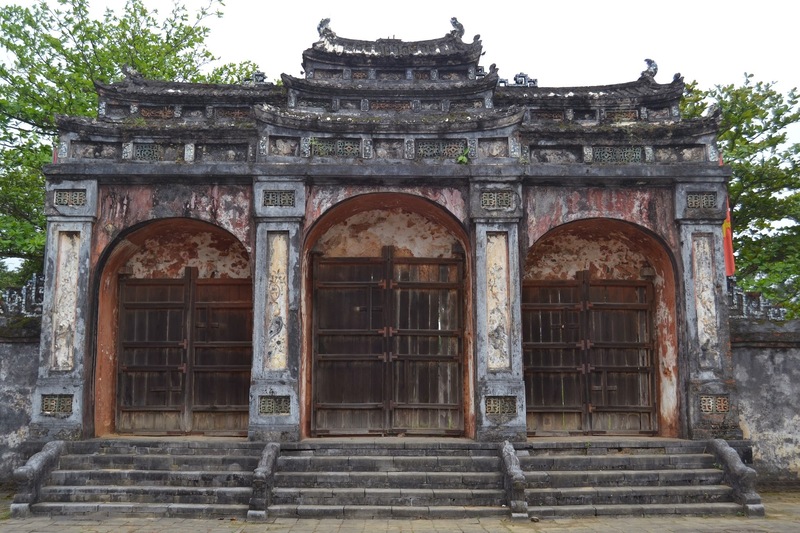 There are some photographic displays of the old Confucian scholars taking the dreaded test for placement, modern Vietnamese women dressed in traditional clothing and the endlessly entertaining landscape of Vietnam. 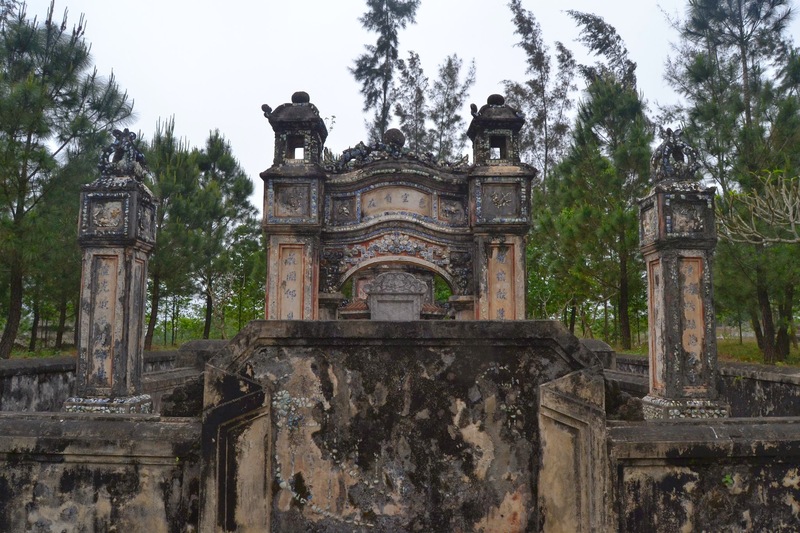 There are also several tombs dedicated to old Vietnamese kings about 2-16 km away from the south bank of the Perfume River. I rode a bicycle to visit three of them. It was an exhilarating ride. I smelled the hearty smell of muddy rice paddies blended with tiny jasmine petals. I smelled the ubiquitous roadside fires. I saw a baby cow resting with her family on the roadside. I saw a big bull elephant putzing around with some trees. I rode through a nice part of town full of interesting and interested faces. The tombs were also good photo opportunities, but not quite as grand as I was expecting. I left town at 11:00, visited three tombs and was back for dinner around 17:00. In all, it’s about 35 km round trip, and I felt it in my knees and thighs. The famous food here is Bun Bo Hue, a redder broth version of beef Pho. I got it at a little place called Cafe You and Me (38 Tran Cao Van St.) It was very similar, but still good. I find Pho is fully dependent on good, clean broth and non-gristly meat, which this place had. I talked with the owner Mr. Trung. He leads tours to the old DMZ and various other places nearby. He told me he opened this restaurant and tour company in 1999. He fought in the war on the south side, and served two years in prison after it ended. “It was hard on body and mind,” he said unsurprisingly. I imagine his tour would be interesting if you like first hand accounts of history. I stayed at the Hue Backpackers Hostel (10 Pham Ngo Lao). They have great staff, wifi, decent breakfast, good beds (doubles or singles), big, functioning lockers, and a nice atmosphere in the communal bar area. They can help you get anything you need: bikes, tours, food, bars, laundry or supplies.